One of the more infuriating things about the Internet is when a website closes down. You might follow a favorite writer’s blog, save links to helpful articles, and share interesting posts on social media. But then one day, you return to the website to discover that it is gone. The site does not exist anymore. All of the useful stories and information are now missing. It is like they never existed. The good news is that you may be able to find those sites again, even after they are offline. You can find help from a website called the Wayback Machine. The Wayback Machine site shows a kind of history of the internet. It shows websites that are no longer online and older versions of current sites. The Wayback Machine provides archived records of publicly available websites. Not all websites or versions of sites are available, but many are. To see the archived images, go to the Wayback Machine website and enter the web address of the site you want to see. You must enter the exact web address, not just the site’s name. Click the Browse History button. On the results page, you will see how many times the website has been archived and information showing when the site was saved. You can click on a year to see the exact date the site was saved. A blue dot on a date shows the page was saved on that day. Click on a date with a blue dot to see what the website looked like on that date. You can only search for the home page of a website. But once you go to the archive, you may be able to find the story you are looking for on the site. If you want to save an older version of a website, you can do that at the bottom of the Wayback Machine website’s home page. Enter the web address of the page you want saved and hit enter. 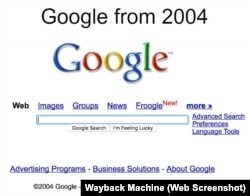 The Wayback Machine recently launched a beta or test version that lets you search for older websites by keywords. Unlike the original version, the beta version lets you enter search terms to try to find websites you cannot remember. It can also help users when they do not know the exact web address. To use the beta version, go to Beta Wayback Machine. Enter the search term and hit enter. You will see a list of results that match your term. 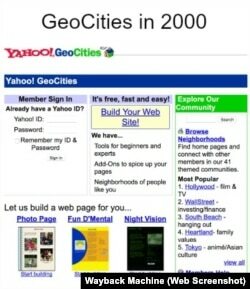 For example, in the Beta version, you can enter "GeoCities" and see a list of GeoCities websites in different countries. The Internet has a history -- perhaps not a long history, but a rich one. The Wayback Machine was based on a computer software program developed in 1996 to document websites, saving the history of the internet. The Wayback Machine website was launched in 2001, using a version of that software. Since that time, the Wayback Machine has expanded quickly, as has much of the Internet. The site was named after the WABAC Machine, a time machine used by a boy and his dog on The Rocky and Bullwinkle Show, a 1960s television series. You can use the Wayback Machine to find closed websites, such as GeoCities, which is now only available in Japan. If you are thinking of buying a domain name, see how it was used before in its earlier life on the internet. If the site was used mainly for spam or unwanted advertising, you may not want to use that web address for your site. You can also see how a website looked in the past and follow its design over the years. Carolyn Nicander Mohr wrote this report for VOA Learning English. George Grow was the editor. Have you ever wanted to see a history of past websites? Have you ever been upset to find a website had closed? What websites have you searched for on the Wayback Machine? article - n. a piece of writing about a particular subject that is included in a website, magazine, newspaper, etc.